Fruit is a sacred subject. I know if I was tactless enough to advise you to exclude it from your diet, a good many of you would shut the book forthwith, scandalised at the mere suggestion. For fruit has a symbolic value in our culture. It stands for life, health, prosperity. It is, first and foremost, a source of vitamins at least, that is what we believe. Well, first let me set your mind at rest; we are not going to exclude fruit. But it is a question of learning to eat it in a different way, if we are to enjoy all its benefits without also suffering its drawbacks, such as a bloated abdomen. Fruit contains carbohydrates (glucose, sucrose and especially fructose), but it also has fibre, which lowers its glycaemic index and reduces the amount of sugar absorbed by the body. Apples and pears are particularly rich in pectin (a soluble fibre), which limits the rise in blood glucose. Energy provided by fruit can be used rapidly by muscles and is therefore less likely to be stored and to lead to the accumulation of body fat. This point is not relevant just to the weight-loss question that we are concerned with. It is based on the chemistry of digestion. When fruit is eaten with other items, it interferes with the digestion of those items, while itself losing most of the properties (vitamins and so on) for which it has been consumed. This is why eating fruit at the end of a meal is the biggest mistake you can make. I know that you are probably viewing this notion with considerable scepticism, so I will explain it a little here and now, even though these points really belong in another part of the book. For starch to be digested, it is essential that an enzyme called ptyalin is present. This is secreted in the saliva. Most fruits have the effect of destroying ptyalin, with the result that any starch consumed along with fruit cannot be digested. The food bolus remains "in limbo"in the stomach, where the warmth and humidity will cause it to ferment. Bloating, flatulence and indigestion can often be attributed directly to this phenomenon. Maybe this explanation sheds a little light on these familiar symptoms. Let us now consider what happens when fruit is consumed with protein-lipids, such as meat or cheese. 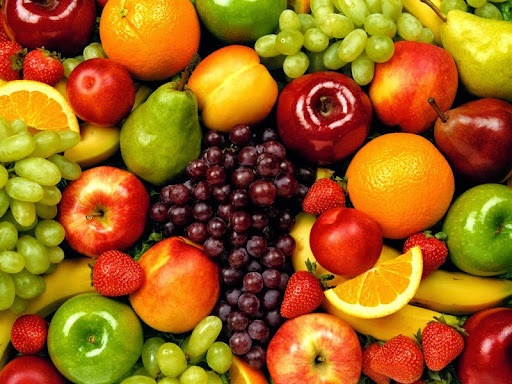 Fruit requires rapid passage into the intestine, where it is normally digested, but in this instance its journey is interrupted for a while in the stomach. For meat remains for some time in the stomach, where the essential enzymes account for the most important stage of its digestion The fruit is therefore also trapped in the stomach where once again the effect of the warmth and humidity causes fermentation, even producing alcohol, and the whole digestive process is upset. At the same time not only does the fruit loses all its vitamins, but (problems never come singly) the protein metabolism is also upset, and the abnormal decomposition of the proteins results in abdominal bloating. So fruit must always be eaten on its own! That rule should be taught in schools. If it were, children would have fewer stomach upsets. It has to be said of course, that at their age the body has the capacity to compensate for errors; but for an adult, and especially for an older person, fruit at the end of a meal is nothing short of poisonous. So then when can we eat fruit? It is preferable not to eat lipids after fruit The small amount of insulin triggered by the fruit could lead the body to store the fats in the ham, eggs, bacon or cheese you might eat for a protein-lipid breakfast. You could also eat fruit last thing at bight before bedtime. It would need to be at least two to three ours after your evening meal. For those who suffer from insomnia (which ought in Any case to be partly cured by following the Method suggested in this book), it is not a good idea to consume oranges just before bed, as vitamin C can act as a stimulant. Fruit can also be eaten in the late afternoon, provided it is well after the mid-day meal (about three hours) and at least an hour before any evening meal. You can even eat a meal consisting entirely of fruit, as long as you really do eat nothing else. As lemon has virtually no sugar, lemon juice (unsweetened) can be drunk at any time or used freely in seasoning (with fish or in salad dressings, for example). Melon as a starter should also be avoided, though, as it prompts just enough secretion of insulin to trap the lipids contained in the main course. I should like to make one last observation on the subject of fruit. Whenever possible, leave its skin on. The skin contains most of the fibre that is valuable for intestinal function, and in some cases most of the vitamins too. Eating fruit skin and all reduces its glycaemic potential, too, so you will lose more weight (or put on less) if you follow this rule. Among the foods to be monitored closely, there remains to be considered the question of drinks and, chief amongst them, alcohol.